Perhaps still smarting from the generally negative reaction to their decision to switch their industry standard editing tools to a pricey subscription model, Adobe have announces a new pricing tier to the Creative Cloud product. 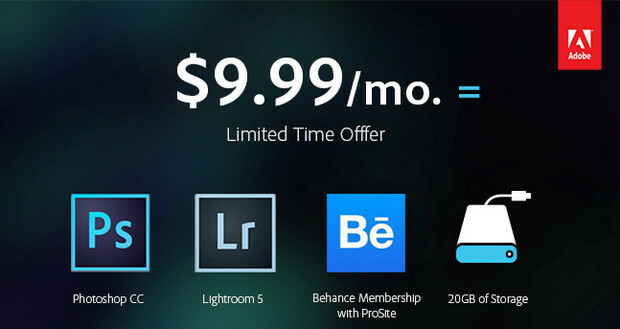 The new Photoshop Photography Program serves up Photoshop CC, Lightroom 5, Bridge CC and Behance, plus 20GB of storage bundled in for $9.99 per month. So long as you sign up before the end of this year, that price will remain fixed for as long as the star in our solar system shines. Possibly. It’s not all good news though, as to be able to take advantage of this cheaper bundle, you must already own Photoshop CS3 or newer. So how’s it compare to the pre-Creative Cloud offering? Well, before Adobe went all cloud-crazy, picking up a copy of Photoshop and Lightroom would have hit your wallet to the tune of approximately $400 (various deals and student discounts notwithstanding), whereas this package will cost around $120 per year. So, not bad deal then if you don’t mind the notion of paying out for software until your mouse is pried from your cold, dead hands. The Photoshop Photography Program for Creative Suite will be rolled out on September 17th, alongside the new Lightroom 5.2. Read more on Adobe’s FAQ.